The Producers Club is a diverse group of philanthropic individuals and families committed to sustaining KPBS' ability to reach beyond the status quo — on television, on radio, and online. Producers Club members share the distinction of being KPBS' most generous annual contributors, giving $1,200 or more each year to strengthen the impact of public broadcasting. More importantly, they are our counselors and ambassadors. They enable KPBS to expand its vision of excellence, to develop new programs, and to employ cutting-edge telecommunications technologies to find innovative ways of better serving San Diego residents. Producers Club Committee (pictured, from left to right): Kathy Bettles, Julie Hatch, President Kitty Wolcott and Patti Nussbaum. Producers Club members enjoy many special benefits, including By-Invitation-Only events with on air personalities, advance notice of upcoming projects and programs of special interest and more. Friday, May 3 | Gold Level+ Offer: General Manager's Breakfast at The Lodge at Torrey Pines. 8:30-10:30am. Enjoy a breakfast buffet and hear exclusive updates about KPBS and what’s to come for the station This event is exclusive to Gold members and up ($2,500+). There is no cost to attend this event. Space is limited and RSVP is required. For more information, or to RSVP, please contact us at producersclub@kpbs.org. *Saturday, May 11 and Sunday, May 12 | KPBS Kids: Daniel Tiger at the San Diego Children’s Discovery Museum. 10:00am - 12:00pm. Join Curious George, Daniel Tiger, Pinkalicious, and other special guests as we explore the world around us through science, math, and literacy. Space is limited and RSVP is required. For more information, or to RSVP, please visit www.sdcdm.org. Thursday, May 30 | Reception & Program with Nan Sterman at The San Diego State University Parma Payne Goodall Alumni Center. 7:00-9:00pm. Mix and mingle with Nan and hear about her new season of A Growing Passion! There is no cost to attend this event. Space is limited and RSVP is required. Additional details to be determined. *Saturday, June 8 | KPBS Kids: Curious George at the San Diego Children’s Discovery Museum. 10:00am - 12:00pm. Join Curious George, Daniel Tiger, Pinkalicious, and other special guests as we explore the world around us through science, math, and literacy. Space is limited and RSVP is required. For more information, or to RSVP, please visit www.sdcdm.org. Thursday, June 20 | Reception & Program with Elizabeth Jensen, NPR Ombusdman at the Catamaran Resort Hotel and Spa. 6:30-8:30pm. Cost: $30 per ticket. Space is limited and RSVP is required. Additional details to be determined. Thursday, June 27 | New Member Reception at The Centre in Escondido. 6:30-8:30pm. Mix and mingle with new members like you and enjoy a panel discussion from the hosts of some of our KPBS Explore shows and podcasts! This event is exclusive to new members who have joined the Producers Club since June 2018. There is no cost to attend and RSVP is required. For more information, or to RSVP, please contact us at producersclub@kpbs.org. RSVP is requested for all Producers Club events. For more information, please contact us at producersclub@kpbs.org. *A KPBS-sponsored or co-sponsored community event, not Producers Club exclusive. As a Producers Club member your gift supports the station and its mission. A benefit of supporting at the PC level is receiving several exclusive invitations throughout the year to attend educational, arts, and culture events, much like the ones you see here! Any ticket prices are offered at a reduced cost and are being subsidized by KPBS and our underwriting partners. Past events include Compost, Cocktails and Costumes, Iceland and West Greenland Post-Trip Reception, Volunteer Day with Serving Seniors, Planned Giving Appreciation Luncheon and Victoria: Season 3 Preview. A chrome Producers Club license plate frame with the KPBS logo in color. A 100% cotton polo shirt with embroidered KPBS logo (available in men’s & women’s styles & sizes). Name recognition on the KPBS.org Producers Club website. Name recognition in the KPBS Producers Club Post (for new members only). A Producers Club group tour of the KPBS Studios for you and your guests led by the General Manager or a senior staff member. Invitations to special KPBS events, including receptions, parties, screenings, and exclusive Producers Club events with NPR, PBS, and KPBS Personalities. An invitation to a New Members Reception with KPBS On-Air Personalities. Two complimentary tickets/admission to a KPBS Producers Club Theatre event. On-Air thank you during a KPBS radio pledge drive. A private tour of the KPBS Studios and lunch for you and your guests led by the General Manager. Complimentary tickets to community and arts events (when available) - past events included Art Alive at the San Diego Museum of Art, San Diego Bay Food & Wine Festival, San Diego County Fair Tickets, Mainly Mozart, and many others. Opportunities to have your gift used as a Producers Club Match during on-air campaigns. Dinner with the General Manager. Opportunity to watch live television broadcasts or pledge tapings in our studios. Quarterly messages from the General Manager. Prominent recognition on the KPBS.org Producers Club website. Invitation to an Executive Level Salon event. Your choice of thank you gifts. Two free tickets to concerts offered during membership campaigns. Gift recognition on Radio, TV or Web. Invitation to NPR Weekend in Washington or the PBS Annual Conference. Exclusive invitations to Major Donor only intimate events. Choose to designate your gift for a special initiative. If you have questions regarding your Producers Club membership, please contact Niru Ramachandran at (619) 594-2028 or by email at nramachandran@kpbs.org. 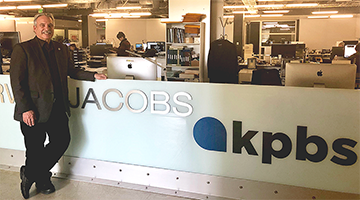 Don't miss the opportunity to tour KPBS! Pictured here, our second floor Joan and Irwin Jacobs KPBS News Center. On your behind-the-scenes tour you will have the opportunity to meet on-air radio hosts, TV reporters and journalists frequently on KPBS; go in the studios where some of your favorite shows like KPBS Morning Edition and Roundtable are produced; and see the TV studio staff preparing for our new show, KPBS Evening Edition. This hour long tour is followed by a short video clip and brief Q & A. Please feel free to bring a guest(s)! Tours are limited to 15 people and fill up quickly, so be sure to contact us at producersclub@kpbs.org to reserve your spot! We look forward to hearing from you.